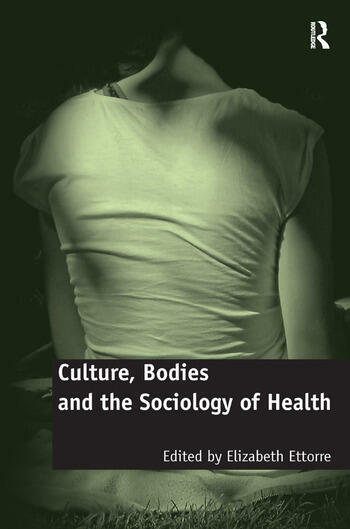 Culture, Bodies and the Sociology of Health explores the boundaries between bodies and society with special reference to uncovering the cultural components of health and the ways in which bodies are categorized according to a form of culturally embedded 'health orthodoxy'. Illustrating the importance of contextualizing the body as a cultural entity, this book demonstrates that the spaces and boundaries between healthy bodies are becoming more diverse than ever before. The volumes international team of scholars engage with a range of issues surrounding the cultural construction of the body as a site of health and illness. As such, it will be of interest not only to sociologists, especially sociologists of health, but also to scholars of media and communication studies as well as cultural theorists. Contents: Introduction: re-shaping bodies in the sociology of health, Elizabeth Ettorre. Part I Bodies and Technoscience: Transplantation, organ donation and (in)human experience: re-writing boundaries through embodied perspectives on kidney failure, Ciara Kierans; Normalized elites: rethinking doping as abnormal practice, April D. Henning; Embodying a healthy running body in a British non-elite road running community, Carol Sutton. Part II Bodies and Representations: The visible body: health representations in a consumer society, Rui Machado Gomes; The internet and medicalization: reshaping the global body and illness, Peter Conrad and Ashley Rondini; The ageing body: from bio-medical fatalism to understanding gender and biographical sensitivity, Jason L. Powell. Part III Abject Bodies: 'Where the excess grows': demarcating 'normal' and 'pathologically' obese bodies, Shirlene Badger; Bodies, drugs and reproductive regimes, Elizabeth Ettorre; Index.